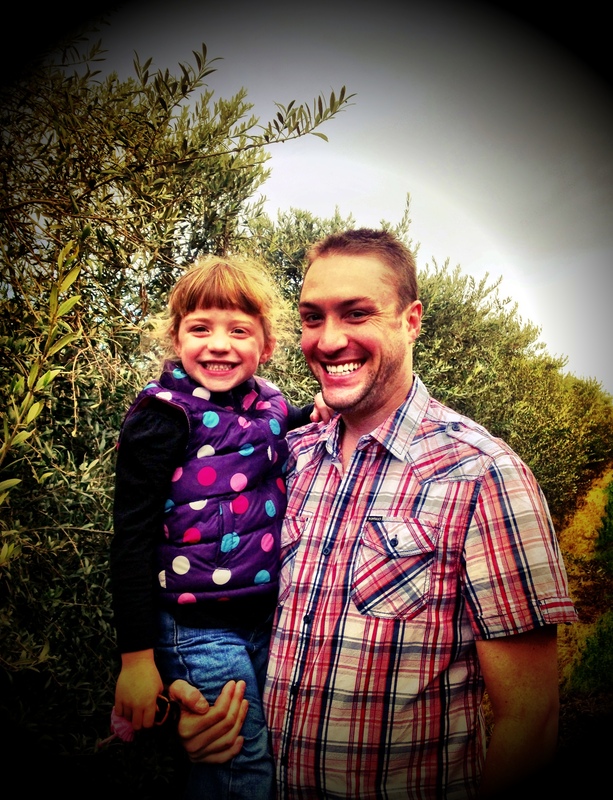 I recently sat down with my 4 year old daughter Giada Coldani to discuss the olive oil business and why she likes olive oil. 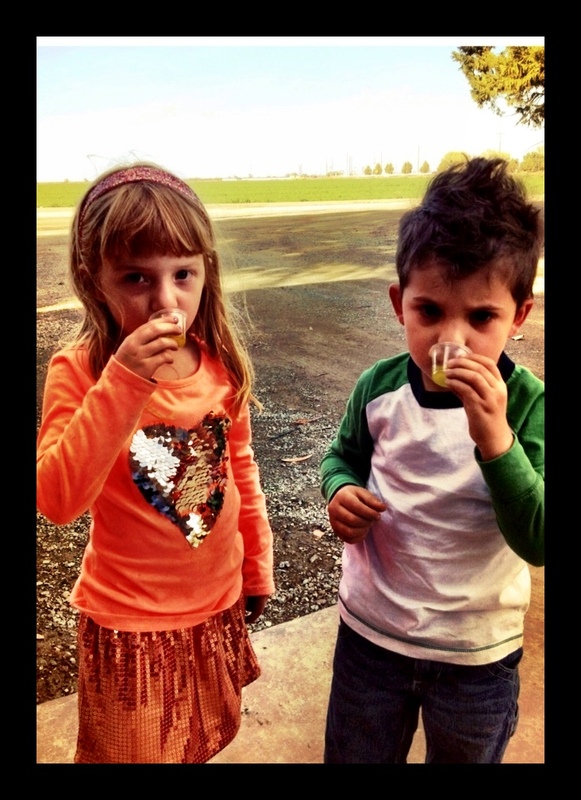 Forced to be immersed into the world of olive oil, both of my children have become fans at a very young age. Both of them have been dipping bread into this gold goodness since before they were a year old and it has gotten to the point where Giada will ask for oil if she doesn’t see it present at dinner (embarrassingly enough; even at other peoples’ houses) The interview with my son Gino will have to be postponed since he is just over one year of age and his vocabulary consists of about ten words. 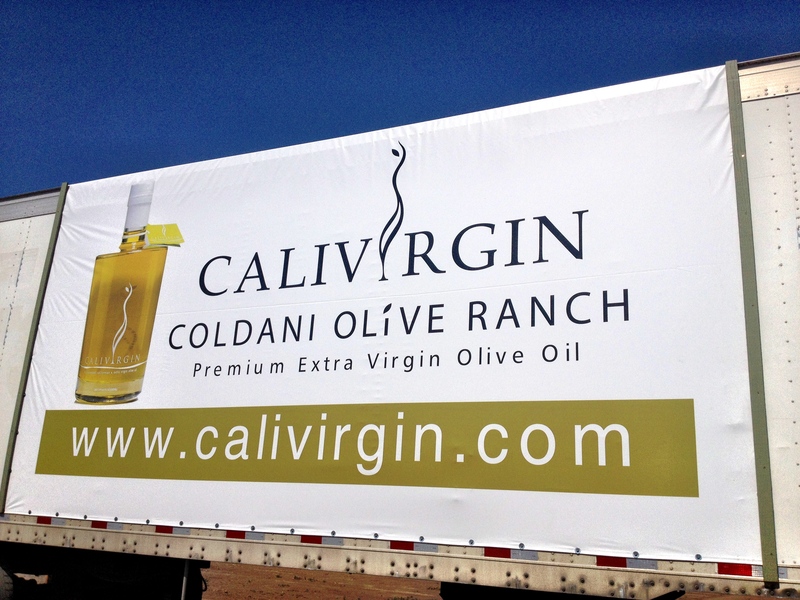 Mike: What is your favorite food to enjoy Calivirgin olive oil on? 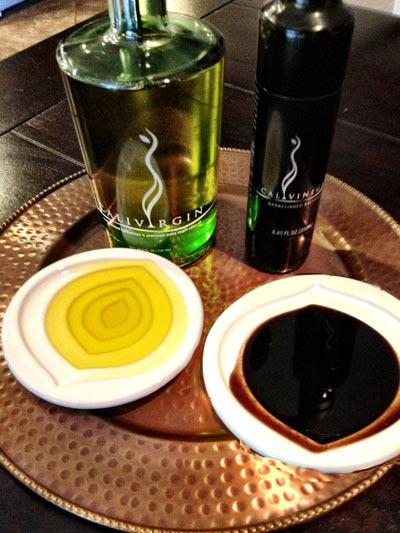 Mike: What is your favorite food to enjoy our Calivinegar balsamic vinegar on? Mike: What did you teach your friend Dylan when you went to the olive mill? Giada: I taught him how to eat the oil and to play with Vito. 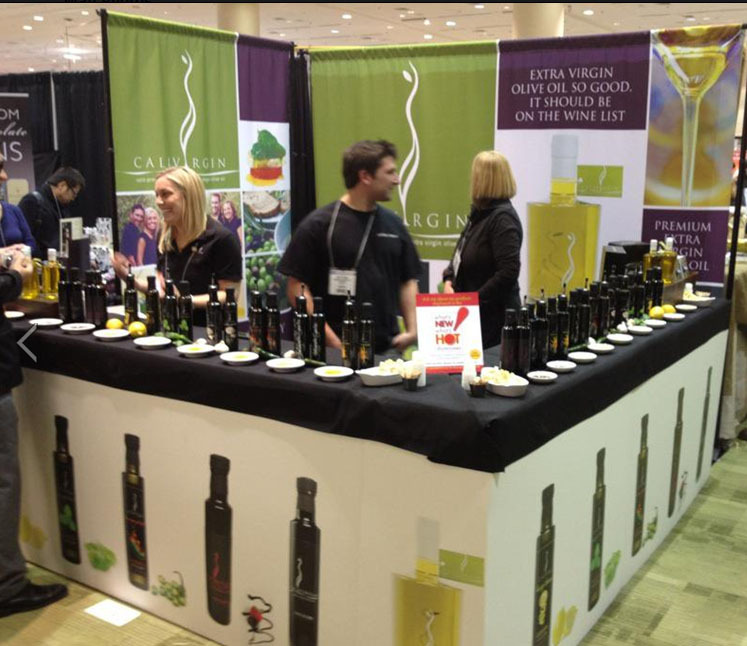 Mike: Which of our Calivirgin flavored olive oils is your favorite? We have Basil, Lemon, Rosemary, Jalapeno, Garlic, Buddha’s Hand Citron, and Jalapeno-Garlic. Giada: I like the Rosemary! Mike: I’m pretty sure you haven’t had the rosemary. Why do you like that one? Mike: What is your favorite part about the olive mill where daddy works? Giada: The praying mantises in the box where you dump the olives. Mike: If you worked for Calivirgin what job would you want to have? Giada: I want to make the olive oil like you! Giada: What do you think it is? Mike: I’m asking you what you think. Giada: But where did you hear about it? Mike: Someone once told me but I forget, what do you think it is? Giada: But where did you learn about polyphenols? Mike: You know I’m supposed to be the one asking the questions. 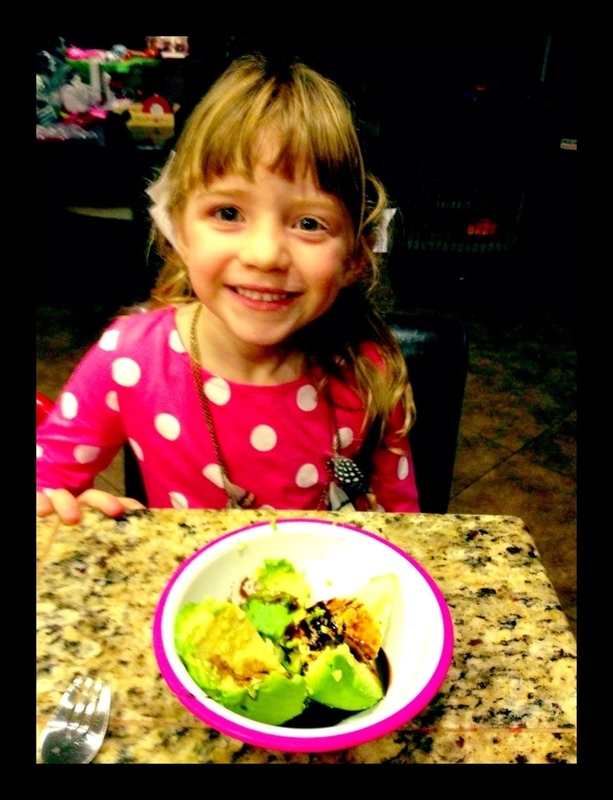 Giada: Daddy, maybe when I’m older I’ll know what polyphenols mean. Mike: Why is our Calivirgin olive oil Extra Virgin? Mike: Ok, you are getting tired, how about this; who is your favorite princess and why? Giada: I like Cinderella, Ariel and Snow White. Mike: Why do you like those ones? Giada: I like Cinderella because she’s pretty and I like her dancing. I like Ariel because she is magical under water and she marries Prince Eric, and I like Snow White because she has a lot of tiaras. Mike: Would you rather work for Calivirgin when you grow up or be a Princess? Giada: I want to be a princess! Mike: I knew you were going to say that. Giada: Then why did you ask me? Mike: Ok, your interview is over. Giada: Now can I have a treat? Mike: Ha Ha! Ok, I did promise didn’t I ! Superbowl Party Olive Oil Recipes. . . Go Niners! Superbowl 47 is upon us and it just so happens our Northern California favorite team is going to be in the spotlight. Goooo 49ers!!! (there is one Raider fan in our family but we mostly just feel sorry for him) Since this years Superbowl is extra special we will be pulling out all the tricks when it comes to finger food and there are a few recipes using our fresh crushed flavored Calivirgin olive oils that are serious winners . The first one has become a family favorite and is perfect for game day. 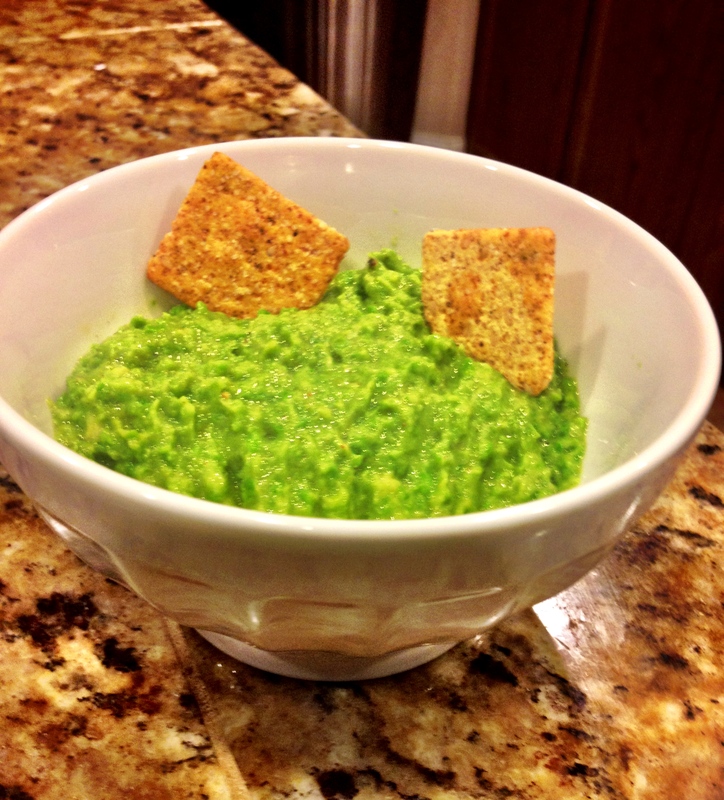 Our twist on guacamole or Mock-amole as we call it; is made with sweet peas instead of avocados. Say goodbye to nasty looking dark brown dip at the end of the day. Since there isn’t any avocados this dip stays bright green until it’s gone! I have made this with our Lusty Lemon EVOO and our unflavored arbequina oil and it is still great but I prefer the sharp citron flavor of our Buddha’s Hand EVOO. 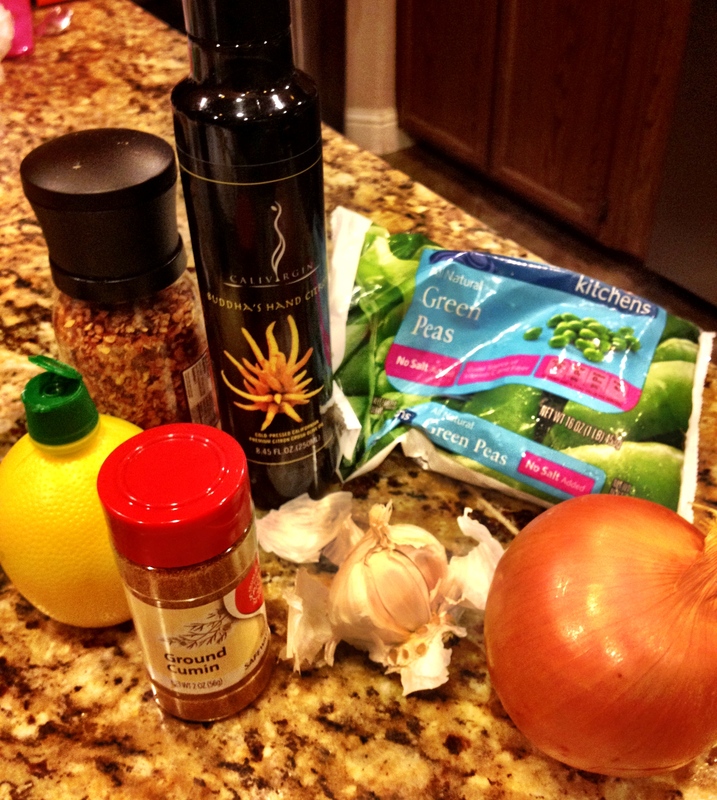 Combine the peas, cumin, onion, and garlic in the container of a food processor or blender. Process until smooth. Add lemon juice and olive oil, and process just to blend. Taste and season with red pepper flakes/spices, salt and pepper. Blend for just a few more seconds, and transfer to a serving bowl. Serve with chips, crackers, or fresh veggies. 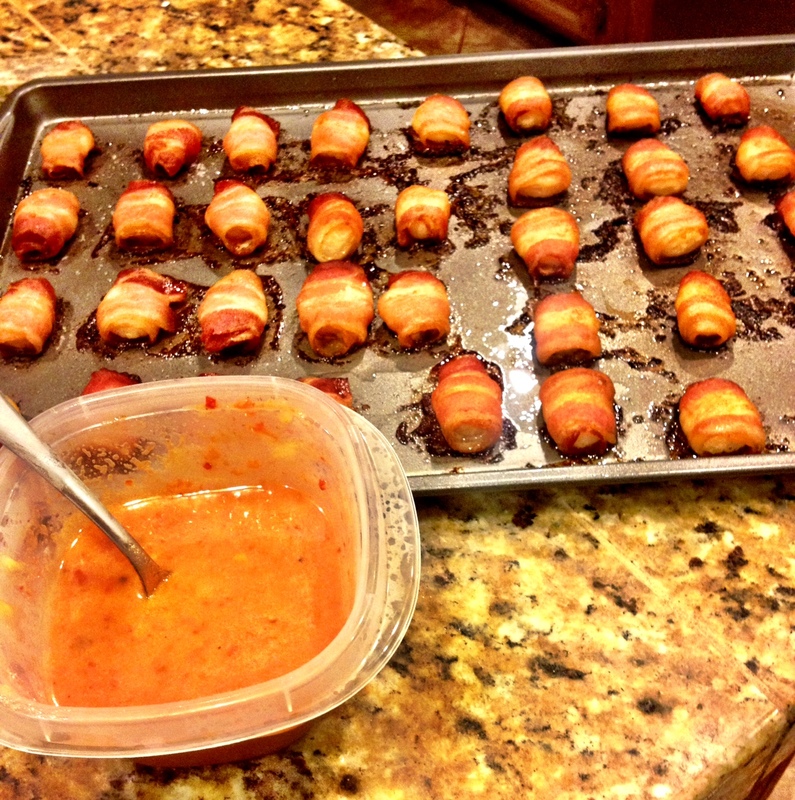 Everyone knows that anything wrapped up in bacon is divine. I have had my fair share of bacon wrapped items but when I came across the idea to put water chestn uts inside I became intrigued. These are very easy to make and the contrast between the sweet and spicy sauce with the savory bacon and the crunch and cool of the chestnut makes it so that you can’t try just one of them. You will be a game day favorite if you show up to a party with these; plus you can make them the day before and then reheat before serving. Yes, Yes, I know. The sauce ingredients don’t sound like they would taste good but you will be surprised. 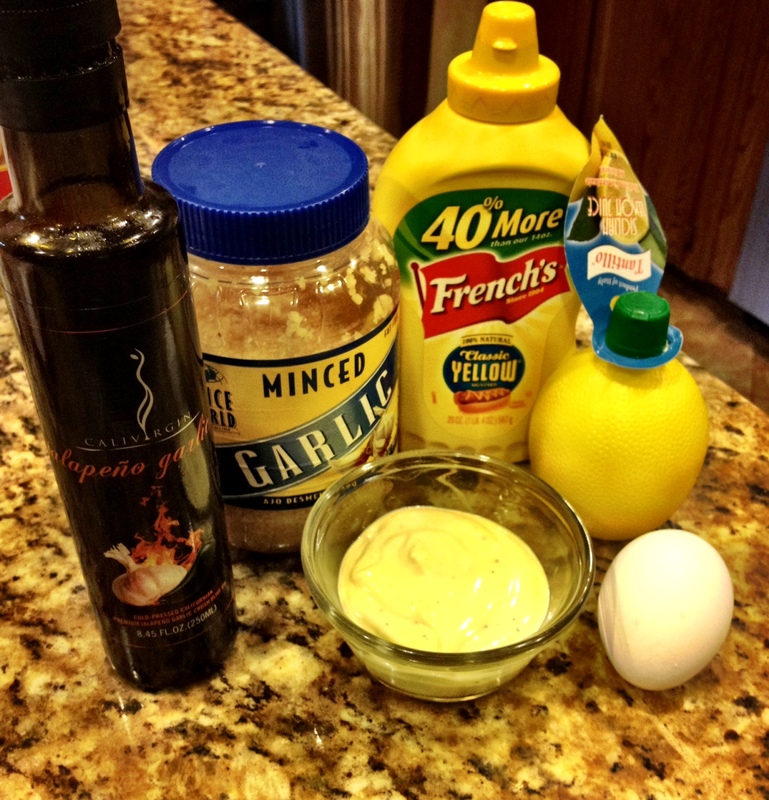 Combine egg, garlic, lemon juice, and mustard in blender or processor. Blend until smooth, then on low speed slowly drizzle the oil in and it will soon thicken and emulsify. 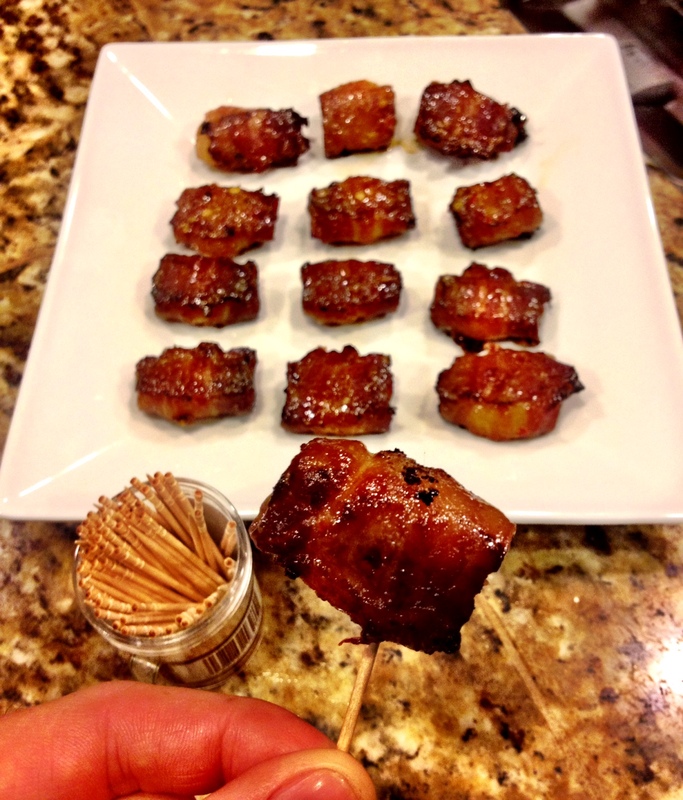 Wrap each water chestnut with a piece of bacon. Place the rolls seam-side down on a baking sheet so the weight of them holds them together. 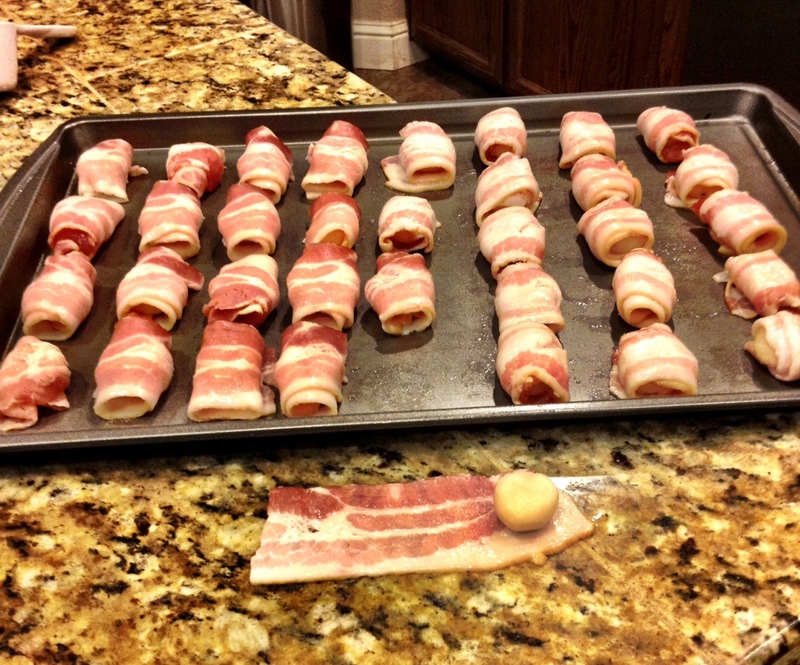 Bake in the preheated oven for 30 minutes, or until bacon is crisp and cooked through. Drain off the grease. 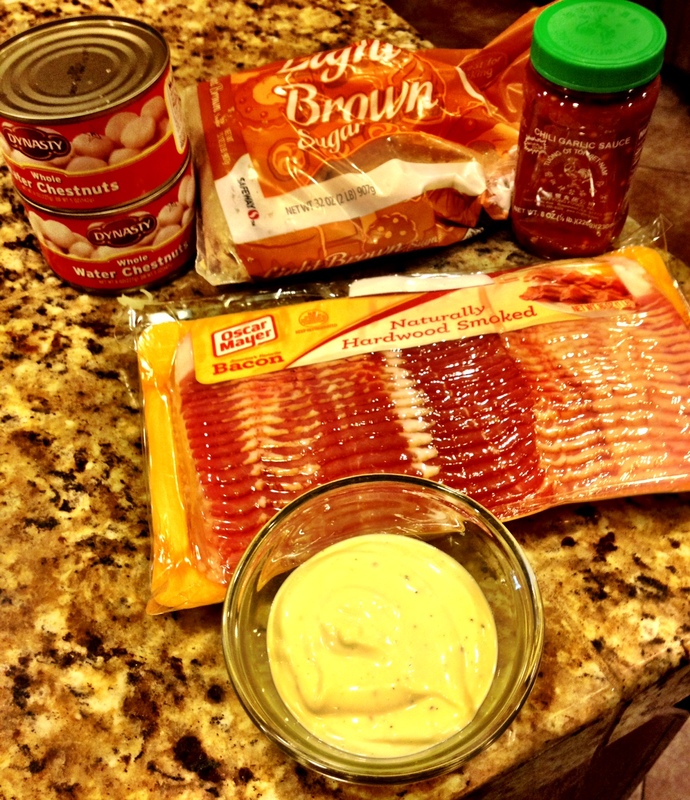 Next, In a small bowl, stir together the mayonnaise, brown sugar and chili sauce. This recipe makes a lot of sauce. You can half it for one package of bacon but I like to freeze the remainder to use at another time. At this point you can reserve the sauce and rolls in the refrigerator until day you are ready to heat and serve if prepping ahead of time. Submerge each piece in bowl of sauce mixture with a fork and place back on pan with same side being down (if you flip them they tend to get too crispy). Return to the oven and bake for another 25 minutes. The lazy way to make these is to use store bought prepared mayo and drizzle over some Hot Virgin Jalapeno olive oil once they have been cooked to add that fresh jalapeno taste and heat. Ever since I have gotten into the olive oil business my wife and I have been in the popcorn eating business. We have 100% changed from microwave popcorn to air popping our own kernels and instead of butter we only use olive oil. I am one of those people that love my popcorn at the theater soaked up with as much butter as possible so the transition to olive oil allows me to put as much as I want with a healthy conscious. The flavored oils are very fun to mix and match, my go-to is usually Garlic or Jalapeno but I have also tried Basil and Lemon and they are tasty as well. My new favorite is a private label we make for a producer on the East coast. He sends us white truffle oil and I blend it with our Calivirgin arbequina oil and bottle it for their company. I have never been a huge truffle guy but he let me try some and I have to admit that the savory taste is addicting. 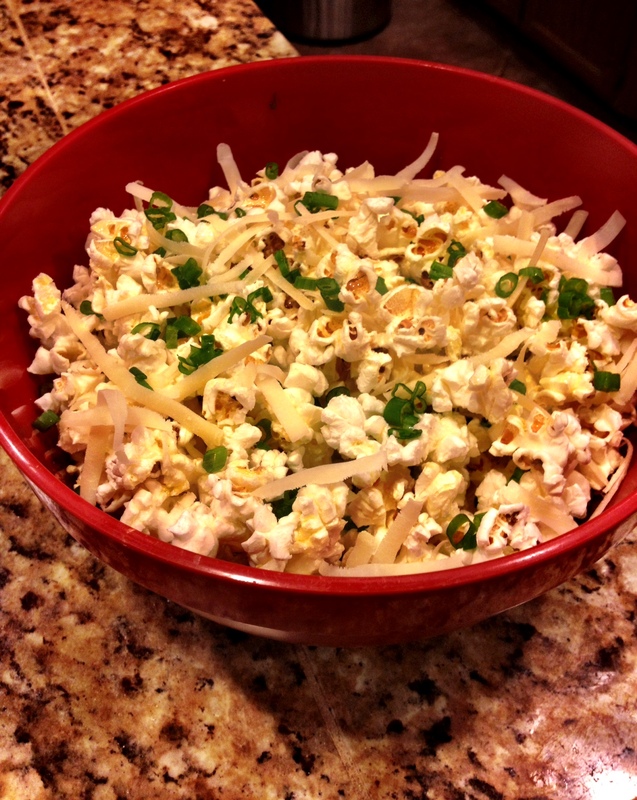 When it comes to popcorn for the Superbowl; throwing a bowl of boring popcorn on the table will surely be passed up. When I do popcorn I’m serious about it, so you will not find any boring popcorn at my house. Adding flavored oils, shaved hard cheeses like Gruyere or Parmigiano-Reggiano, and green onion or chives is what brings this simple snack to a whole new level. Gruyère, Parmigiano, Pecorino or other hard cheeses. My life has changed since buying the microwaveable Presto PowerPop bowl made by Redenbacher. It’s easy and healthier than the bagged kind. All you do is pour some kernels in the bowl with a little olive oil and microwave it. The bowl has a disc that directs the heat to the kernels. Although, you can certainly use any other popcorn maker or bagged popcorn for this recipe. Drizzling olive oil and grating hard cheeses for taste and adding green onions or paprika for color and spice is what makes this no ordinary popcorn. Experiment and enjoy! One part of our company that often gets overlooked is our appreciation for our vendors, retailers, bloggers, chefs and restaurants. While traveling for business or pleasure; our family tries to stop in and say Hi at as many stores as we can. We also try to travel and have dinner at just about every restaurant that uses our oil in their kitchen at least once a year. Many of the specialty food stores are also family owned and operated much like ourselves; and even if we have never formally met, you tend to develop a nice relationship with these companies and stores. I invite you to read about only a few of the companies that have helped Calivirgin grow and check back to see posts on a few others. Located right in our own backyard, Jeremy and Choral have been close friends since day one. It was their design studio that helped sculpt the fantastic look of Calivirgin. 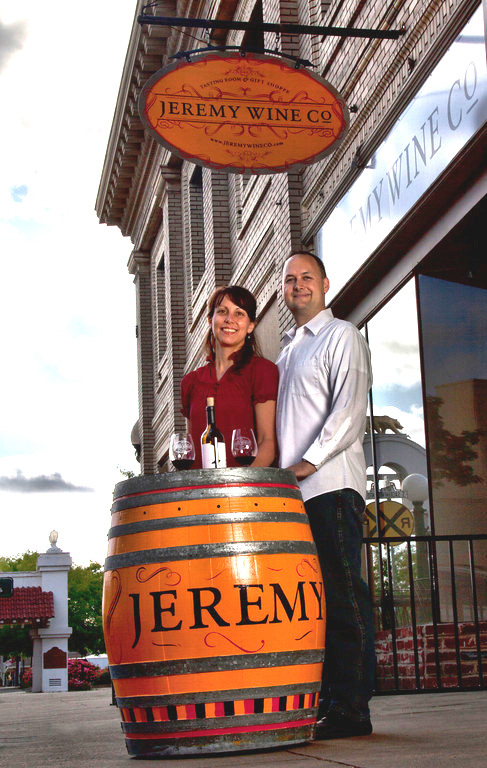 They enjoyed sharing and drinking wine along with the label design so much their passion created Jeremy Wine Co. 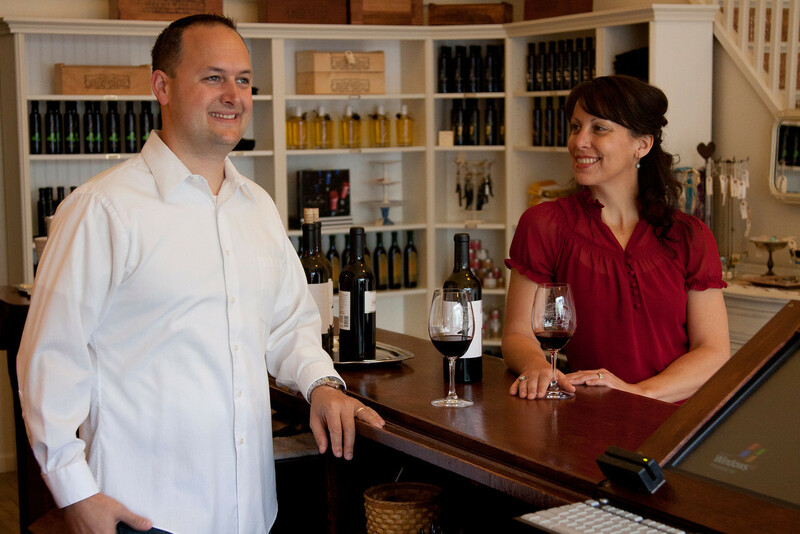 Located in Downtown Lodi, their tasting room is a perfect place to relax and grab a glass of wine. Giving a gift and looking for a bottle with a label that is clean and modern with wine that tastes great? 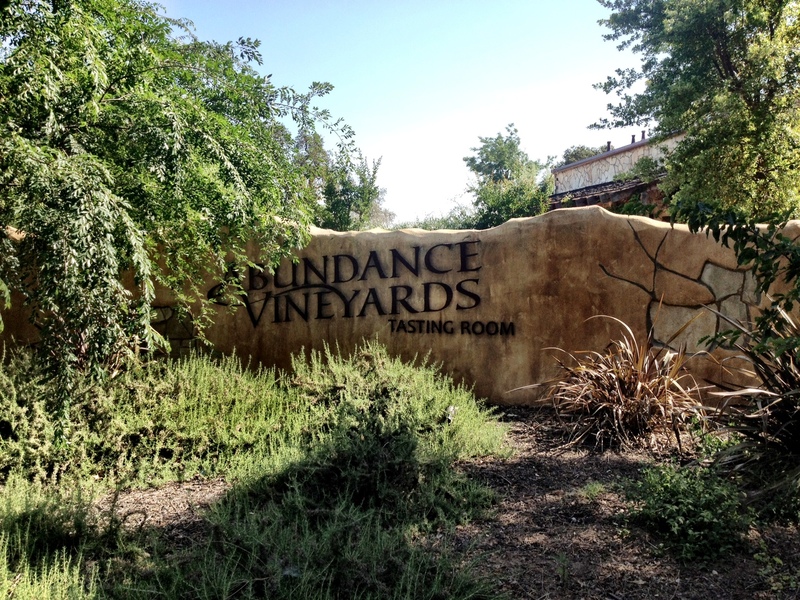 Check out their line of wines or join their wine club. Four out of the six Calivirgin team members are California Polytechnic Graduates so the fantastic weather and charming downtown of San Luis Obispo will always hold a special place in our hearts. 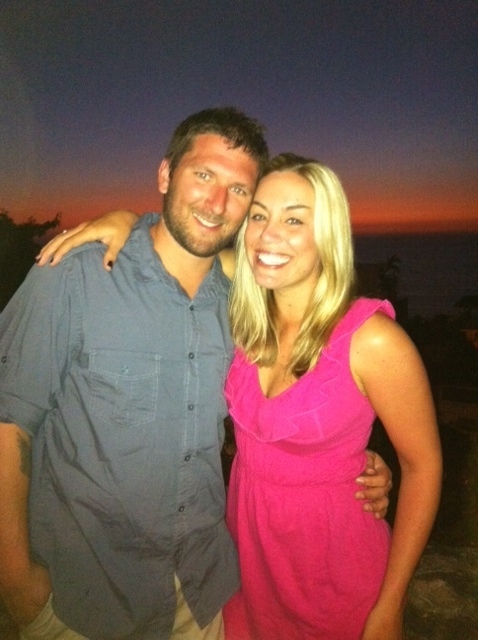 Ray opened on e of the first WeOlive franchises downtown in the heart of SLO. WeOlive stores sell many of the 200+ California produced olive oils and they only sell oils that are certified extra virgin by the C.O.O.C. www.cooc.com You can also buy dipping dishes, tapenades, olive oil bath products, and pretty much anything else olive oil related. 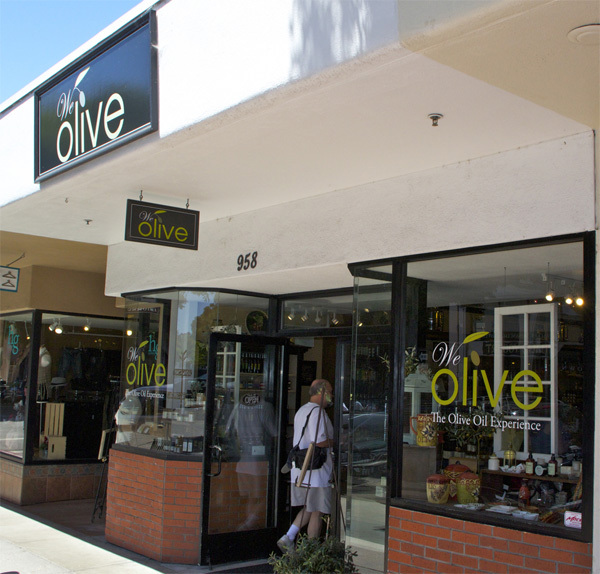 Not only do you get to taste many of the oils before you buy but Ray and his employees (Many of whom are CalPoly students) are versed in olive oil and oil production and are happy to answer all of your questions. Ray said he loves the CalPoly connection Calivirgin has and his customers enjoy buying oil from an alumni grower and producer. 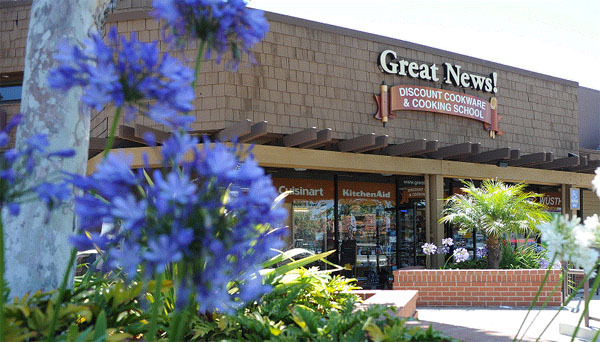 Great News Cookware and Cooking School is a fantastic place to check out if you are ever in the Pacific Beach area of San Diego. 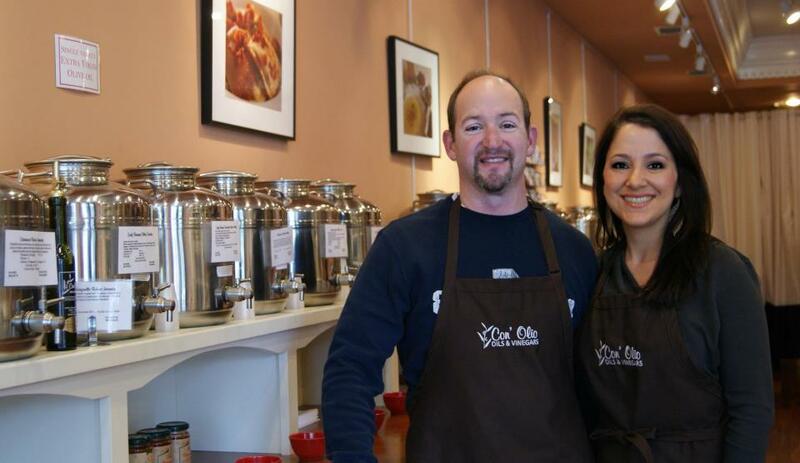 They like to say they are the perfect blend between a home kitchen and a cooking school. Not only do they teach you how to cook at home but their store carries hundreds of great cooking gadgets, tools and products. You really need to check out their online calendar of cooking classes. Classes are daily and you can sign up for a class online. I just wish they were located closer for me to take advantage. “We all love your product! 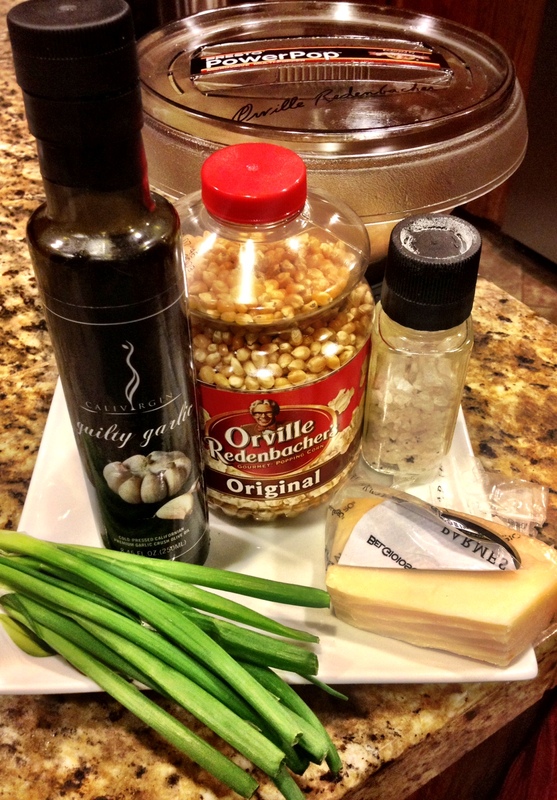 I could put Calivirgin on anything.. Another favorite is to drizzle it on a white or margherita pizza – yum!” Below is a recipe from kitchen Manager Jessica Rhomburg; something simple and fresh that she’s created a few times at Great News! Preheat your grill to medium high heat. Toss sliced strawberries with balsamic vinegar and sugar, set aside. Drizzle olive oil over the sliced baguette and lightly season with a pinch of salt and fresh cracked pepper. Grill bread on both sides till nice grill marks show and the bread is golden brown. Spread Nutella on each crostini and top with the balsamic strawberries. Place on a platter and serve! Market Hall Foods is located in North Oakland California in the Rockridge area. 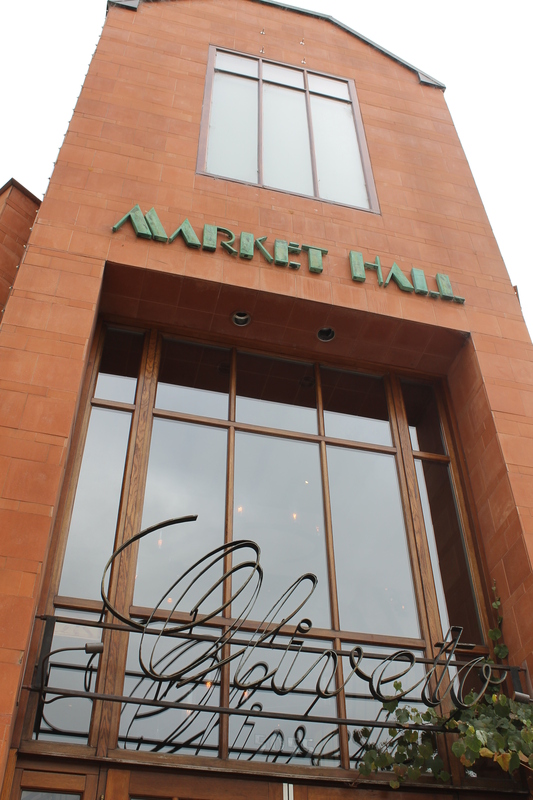 A european style market place; Market Hall Foods is recognizable for its unique architectural design as well as the eight individual food and flower shops which open out to the sidewalk. A one stop shop for artisan oils, vinegars, breads, pastas and cheeses to name a few. Wether you are looking for hard to find imported products or locally produced items Market Hall Foods has it covered. Market Hall Foods marketing & communications director Sara Feinberg was happy to share, “We love using the jalapeno garlic or the jalapeno oil for corn-on-the-cob. I also use those oils to fry my eggs in the morning. I love basil oil drizzled over a watermelon and feta salad – perfect for summer dining al fresco!” Market Hall Foods is also a connoisseur of fresh 100% extra virgin olive oil and they stock their shelves with some of the best California grown oils available in the market today. 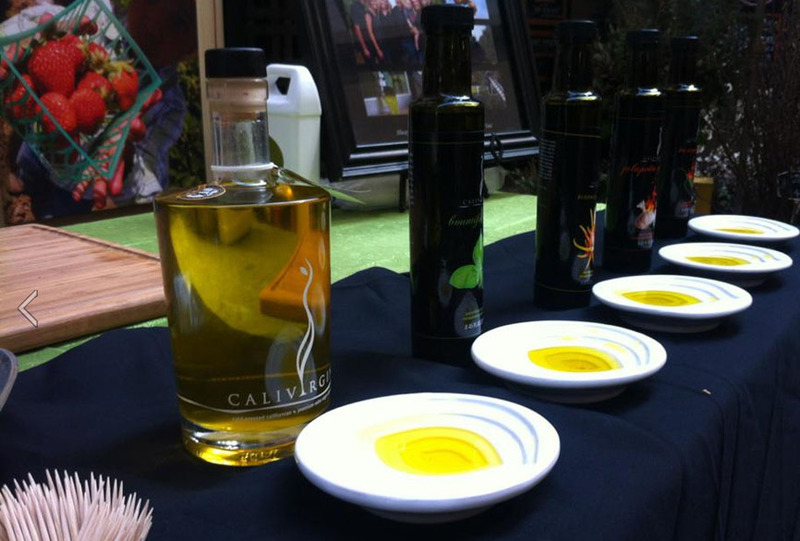 They even host an annual California Extra VIrgin Olive Oil Festival around the month of March where they sample food pairings, offer oil tastings and give cooking demonstrations featuring fresh California grown olive oils. This is only a small sample of locations who help spread the word about Calivirgin Premium Extra Virgin olive oils and vinegars. Check back to read about some of the fine restaurants, chefs, and food blogs that also enjoy using Calivirgin olive oils. If you are intersted in bulk oil oil or flavored oils for your restaurant or private use or you would like to carry our products in your store please feel free to contact us and we would be happy to get you more info. Click here for a link to all of our locations and our contact info. How hectic and busy is your day? 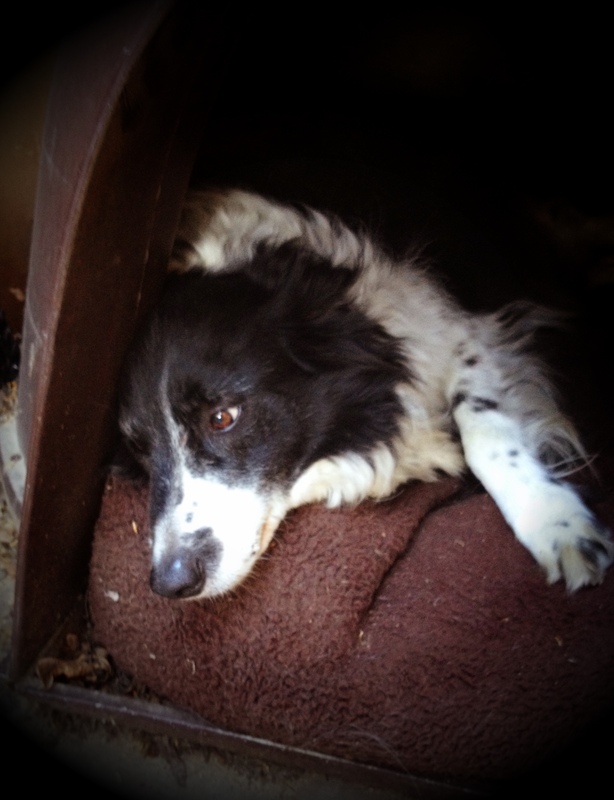 I feel as if each year that goes by our lives get busier and busier. Event free weekends are few and far between and now that my wife and I have two little ones it seems as if an hour of doing nothing is unheard of. 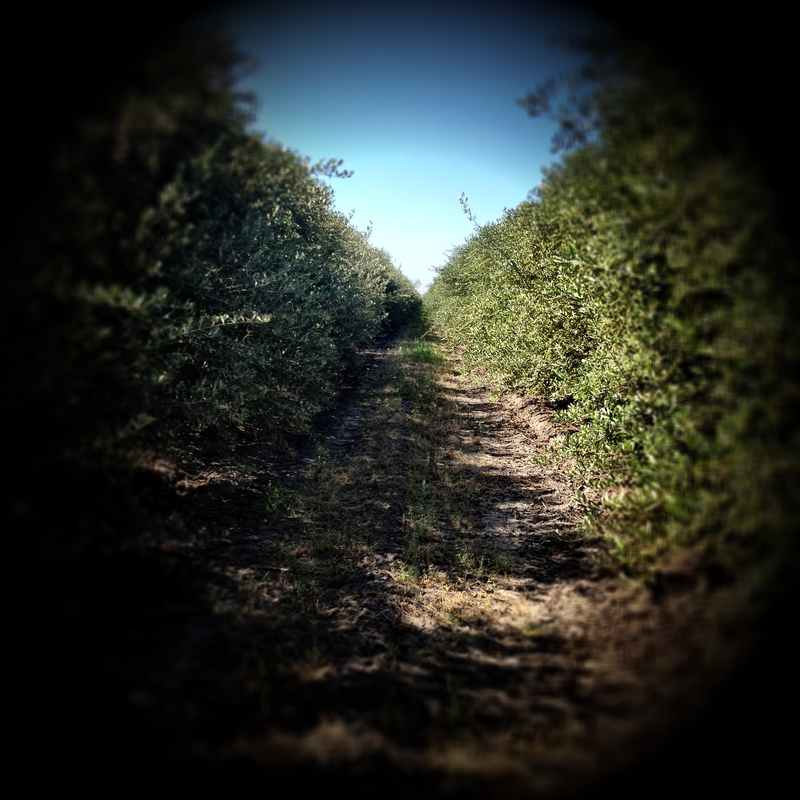 If this sounds close to your schedule I invite you to take a walk through one of our olive groves; even if it is for only 30 minutes. 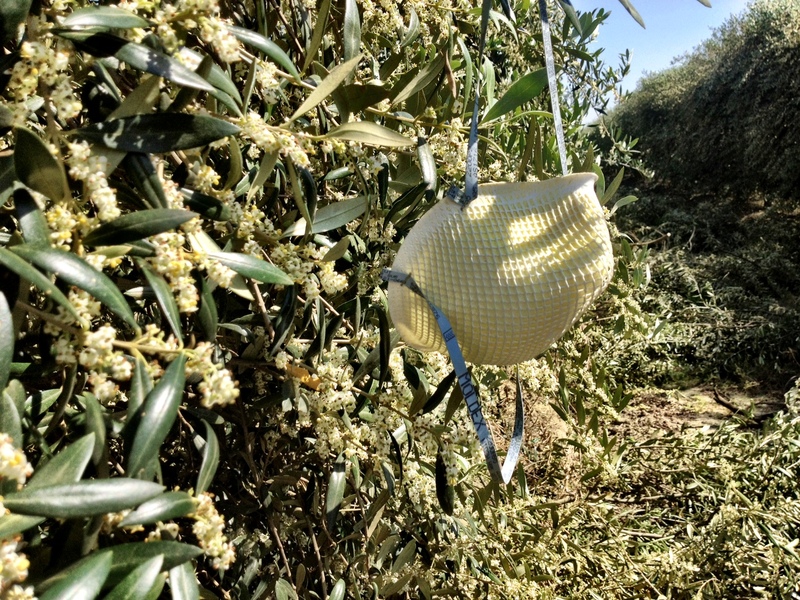 I never really thought about it until the other day while I was out checking our irrigation lines; being in the middle of an olive grove almost places you in a whole new world. Our trees are planted in a high density fashion along trellis as an 8 foot tall long hedge. In the middle of the grove you seem lost to the outside world. You are limited to tunnel vision so you hear sounds you normally wouldn’t hear and the trees block out sounds such as traffic or neighbors. On a still day you feel as if you are wandering in a Hunger Games’esq labyrinth delicately walking and taking in every sense of sight, sound and smell you can; quietly waiting for what your senses will observe next. You notice the sound you make in the grass below your feet and the sound of the bees flying around carrying off pollen. You hear the caw of crows you can’t see and you see the outline of a rabbit 75 yards ahead of you down the row. You also notice the slight fragrant smell of the trees and the earthy smell of soil. The trees are so dense that they have become home to wildlife we didn’t see much before. 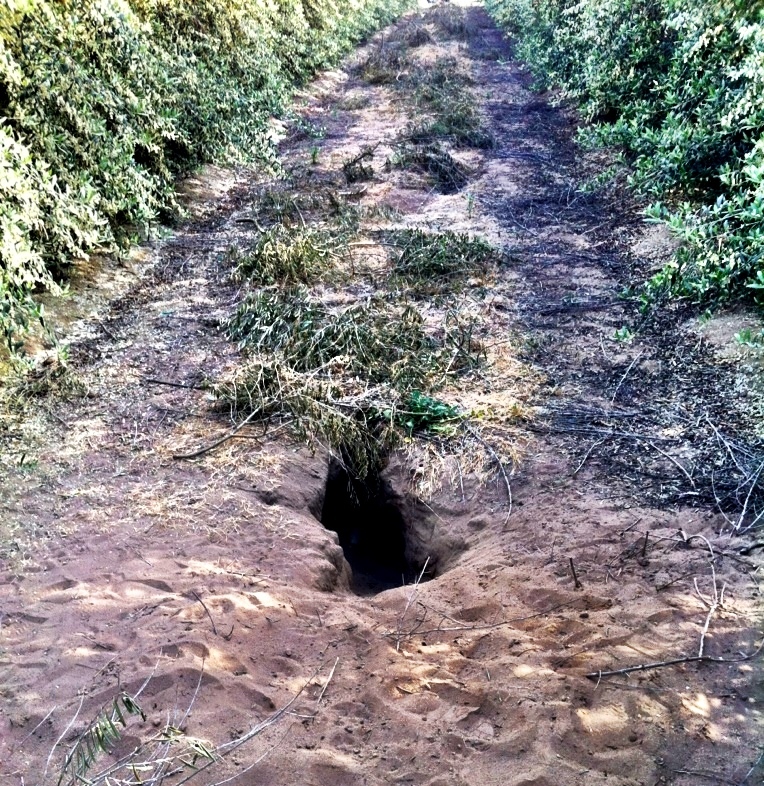 Seeing a Jack Rabbit was slightly rare but now the groves have become loaded with them. Quail and doves frequent the area and you can almost always spot at least one coyote any day of the week. Because of the thickness of growth you often find yourself walking right up on some of these critters; startling you both. While writing this I am laughing because I know it sounds like I have been “chasing the white rabbit” or something. Trust me, there is something therapeutic about it. I am not really as eccentric as I am sounding here. I am sharing this with you and at the same time I know I am blowing my cover. I am sure I will hear it next time I go to leave a house full of crying children to “go work on the ranch” leaving my wife to fend for herself. If you are in our area feel free to stop and take a stroll down a row and let me know what you think; I am sure you will not be disappointed. It’s Friday! 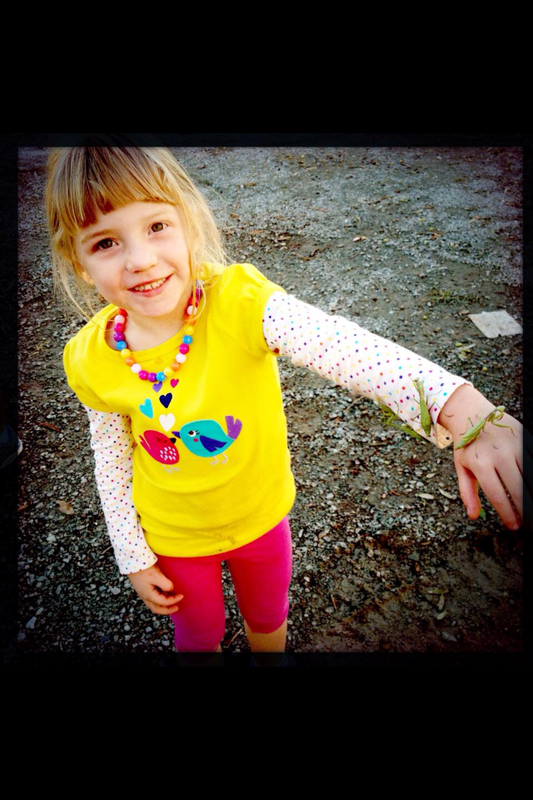 Enjoy some tidbits of the everyday things going on in our lives here at Coldani Olive Ranch. I planted a six inch seedling the day my wife Julie and I got married ~ 9/16/2006 ~ Quite frankly; as an olive tree farmer the tree looks a little pathetic because it has been restricted in this pot but we also received the beautiful pot as a wedding gift and I wanted to be able to take the tree with us if we moved so don’t pass judgment on my farming skills from the looks of it! I like to think it’s an antonym for our marriage. 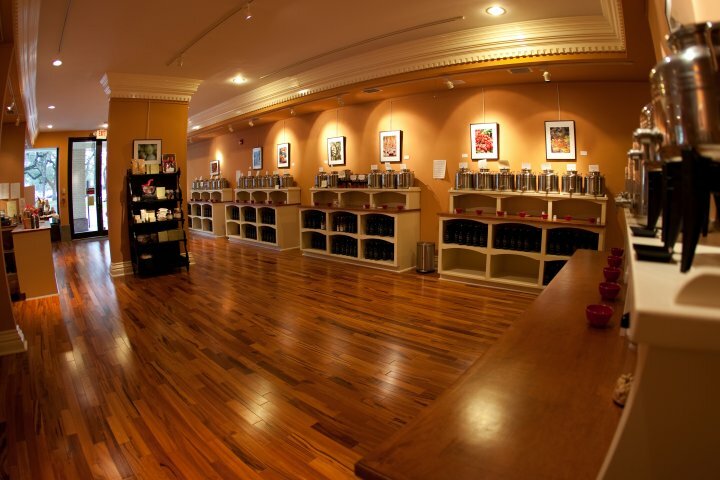 June 8th 2012 will be our first ever pick up party for our olive oil Club Members. We will be holding it at Abundance winery in Lodi. More notice will go out but it should be a great time with oil tastings/pairings, a band and a complimentary glass of wine. If you are a club member and in the area swing by and grab your shipment and enjoy the evening with us. Get your Allegra or Zyrtec ready. Working in these groves while the trees are in bloom is messy work and will cause a fit on your allergies even with a dust mask. Olive pollen is very fine and can even travel miles away in gusty winds. Look for our new sign on the side of a semi truck. Currently parked on our oldest block of trees off Interstate 5 and HWY 12. This is the second one; the first truck had been stolen in the night after it sat for about three days. WHO steals an entire semi truck trailer!? Who would have thought that I would have to pull off decent tires from this trailer and install bald ones trying everything to keep this one from being tempting? 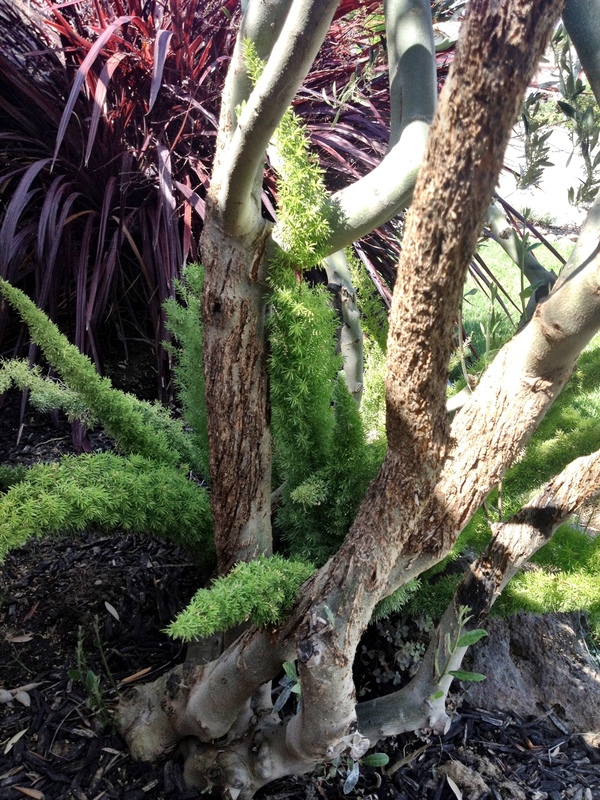 This is a mission olive tree I planted for aesthetics in my front yard. Nearly every day there is a cat using it as a scratching post and I have seen at least three or four different cats on this tree. I’d like to think that someday when this tree gets to be 100 years old there will be an interesting visual story around the base of it. They’re here! Calivirgin needed more hands so my sister Gina and her husband Scott moved from the always sunny and mild weather of San Diego back to Lodi to work with the company full time. At least it wasn’t like they were moving to Alaska. I think last I checked we have been picked up by 33 different retail stores since January first of this year so cracking the whip seems to be working. There are many different uses for olive oil. I could make an entire blog post on them alone and I just may do that but one that we have been receiving many comments on is the use of our lemon olive oil as a makeup remover. It works! Plus it leaves your skin moisturized with a light fragrant smell of lemons. Try it sometime! I saved my favorite photo for last. At first I thought a twenty pound gopher or ground squirrel had finally done us in. Our irrigation nemesis jumped out of this hole. A mother coyote and eleven, YES ELEVEN! pups scattered in all directions from this den which was dug right in the middle of one of our rows of trees and about in the middle of the entire grove. Coyotes are a real problem, they chew on our drip irrigation nightly to the point that we will not fix the drip lines until the night before we water otherwise we will just have to fix it twice. They like the drip lines as a source of water but there is also evidence that the just chew on them as a chew toy. Coyotes easily cost us in the thousands every year in repair parts & labor. 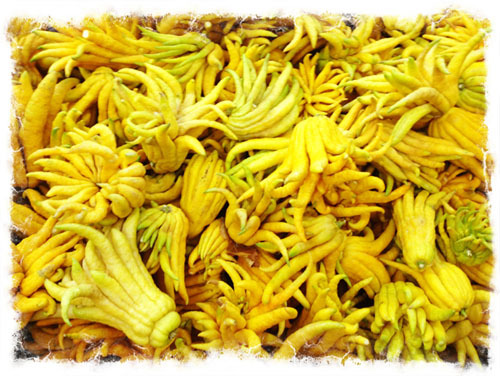 Buddha’s Hand Citron And An Olive Oil That Brings Prosperity? 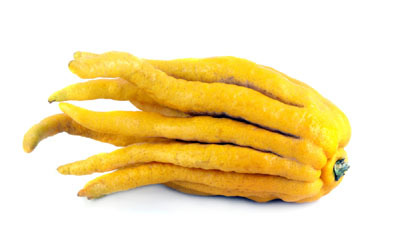 Buddha’s Hand Citron (citrus medica var. sarcodactylis) also known as the fingered citron, fragrance citron, or simply that weird lemon squid looking thing sold in some markets; is often gawked at but relatively unknown and somewhat mysterious. For centuries the Buddha’s hand citron has been treasured by Japanese and Chinese cultures symbolizing prosperity, longevity and happiness. Often popular at New Year’s , it is supposed to bring a household good fortune. It is often used instead of flowers as a centerpiece that perfumes a room for weeks with its delightful citrus smell and a fruit with the fingers in the closed position has been said to resemble praying hands. Citrons from a valley grower and created an assembly line of family members to hand cut each fruit into smaller pieces so that they would fit into the olive mill. The Buddha’s Hand is then processed with our estate arbequina olives and the result is a unique tasting citrus flavored olive oil. I may be going out on a limb but I have searched the world and I believe we are the first and only ones who make a flavored olive oil out of this fingered fruit. I am often asked what it tastes like but I am still working on a good answer. It doesn’t taste like lemon or our Lusty Lemon olive oil. The Buddha’s Hand olive oil has a true citrus flavor. Tasted straight by itself, your first taste is somewhat pungent followed by the floral bouquet of citrus. I find that it is better accompanied with foods than by itself, the citrus flavor really makes salads pop with brightness adding a nice compliment to bitter lettuce greens. In the short time we have had it available people have told me they enjoy the flavored oil on fish or as a flavored substitute for butter in cakes and even an accent to marinade wakame seaweed salad. I recently mixed some with garlic and a dash of paprika and coated some artichoke halves before grilling them on a BBQ and they turned out fabulous. As far as bathing in prosperity, longevity and happiness . 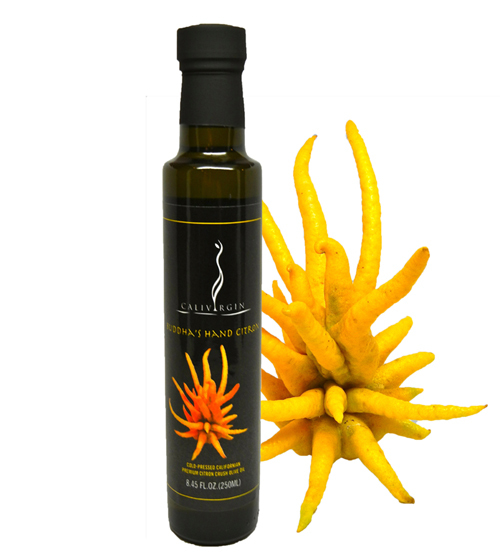 . . olive oil makes a great skin moisturizer and our Calivirgin Buddha’s Hand olive oil has a nice citrus smell so lather up and perhaps this magical fruit will change your life! That might be a stretch but I know a lot of chefs and foodies will appreciate what we have done and have fun pairing it with food in the kitchen. Trade Shows, Farmers Markets, and Fairs…Oh My! Our company still consists of all family members and we split up the jobs of farming, sales, marketing, packaging, & distribution. Growing this small family business has been a blast and our best sales pitch to date has always been to simply get someone to taste the oil. We are proud of the unique and elaborate packaging and design but we always say it tastes as good as it looks. Getting a following and people to taste the oil often involves setting up tasting booths which leads me to this topic. At first glance it seems our yearly calendar has something on nearly every weekend of the year. Our family trades off who attends the events and many of them are attended by all of us as a group. 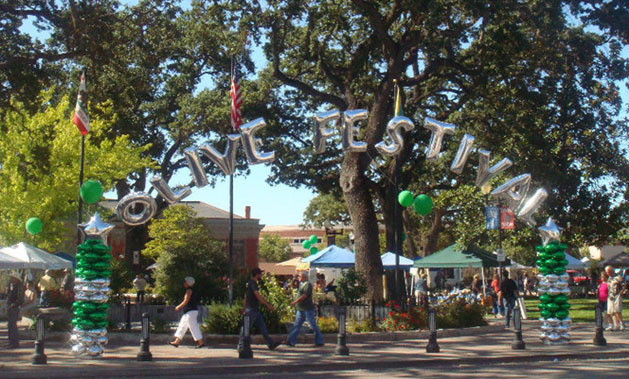 From the Paso Robles Olive Oil Festival to the San Francisco Fancy Food show all the way down to our local Lodi Spring Wine Show and St. Marys Italian Olive Oil Festival; just to name a few. Each event has its own flavor and along with that, its own idiosyncrasies. We have met many great vendors traveling acts and olive oil families on the road, as well as many interesting and intriguing customers. Learning event or market etiquette has also been a hoot and at times eye opening. Learning things such as the fact that homeless vagrants will eat all of your bread before the market even opens if you have it displayed early have been mistakes we have made a few times. The last hour of wine tasting events always draw a long line to our Calivirgin booth as well. “Why”, you might ask? Because we often have the only food available at that hour. Watching purple toothed people hold each other up while grabbing handfuls of bread is comical; however, it is often in this last hour of wine events that we have most of our sales as well! trades . This last year I think we went home with an elaborate box of chocolates, some coffee flavored tea, a huge wheel of brie cheese the size of a basketball, truffle sea salt, Madeleines/Brownie Bites/&Palmiers from Sugar Bowl, and a package of macaroni pasta that was supposed to be animal shaped but looked a little more phallic than the package suggested. I’m not sure the theory of going home lighter works in our case but if you are looking for a group of suckers who will trade a $15-$30 bottle of oil for a pair of mint flavored chopsticks swing by our booth! If you have ever sold products or worked a booth at a farmers market, trade show or expo you know the expression, “people say the darndest things.” Recently over dinner our family was reminiscing about some of the classic one-liners we have heard over the years working countless display/tasting booths and it got me thinking about sharing some of them. My apologies in advance if you remember giving me material for this piece; believe me when I say that it is often phrases like these that make the long hours of a market or show bearable at times. While keeping in mind that the majority of patrons who taste test our products seem to genuinely enjoy them (or at least they are really good fakers), there are from time to time people who express their distaste. I’m not afraid to admit it; if you are in the food industry and you say that you have never had a negative comment then you are a liar and I don’t care if you are giving away ice cream topped with $100 bills. Someone, somewhere, sometime will blow you away and complain or offer a suggestion on how it could be better. This is in part why these events are so much fun. I truly enjoy interacting with people and the anticipation of the facial expressions or reactions they get when they are about to taste our oils or vinegars are almost like a mini adrenaline rush. Again, don’t get me wrong; I could go on and on with positive quotes or reviews from chefs, aficionados, foodies or the occasional Sunday stroller but today I wanted to add a little humor. Now for some one-liners! One lady tasted every product we had. All of our balsamics, our extra virgin olive oil and all of our crushed flavored olive oils and then plainly looked at us and said she didn’t like any of them. (Kind of bold but fair enough right? I appreciate the honesty) Then about two hours later she came by and bought two bottles. I really wanted to ask if we were to be included on some “things not to buy” list but resisted. Most people who taste fresh extra virgin olive oil can’t believe how much flavor it has. They are used to the rancid and sometimes refined garbage they typically buy and didn’t realize how fresh olive oil is supposed to taste so we get a lot of feedback on this. Taste descriptors such as a grassy taste or fruity are often discussed. Some people swear we have added something to the oil to add taste. “You put bananas in there don’t you!” I have been told. 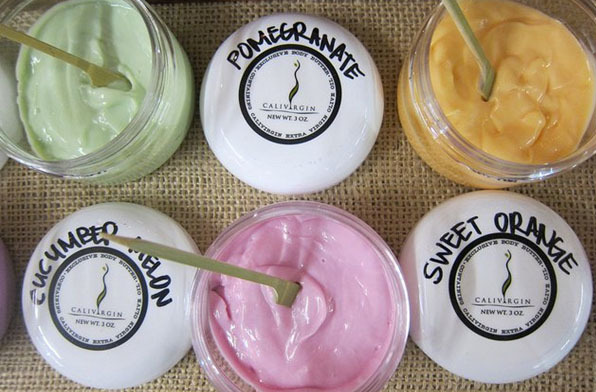 At a few events, (usually wine tasting events) we have turned our back for a second and then returned to find someone (usually a guy, sorry guys) with a spoon eating our samples of Calibody hand moisturizing cream made with olive oil. I guess with fragrances like Cucumber Melon and Lemon Pound Cake it can be sort of suggestive but I am pretty sure the last guy ate Cool Rain. He seemed to enjoy it and I didn’t have the heart to embarrass him. What’s Wrong With Infused Olive Oil?